Switchgear packages and other electrical products imported from Hager of Europe and Japan’s Mitsubishi have gained broad acceptance in the Gulf. According to KV Srinivas, electrical manager of Voltamp Switchgear Co, Bahrain, which imports these brands, brand origin and price play an important role in decisions by managers to procure imported products for local projects. Voltamp also manufactures its own switchgear panel boards and distribution boards. 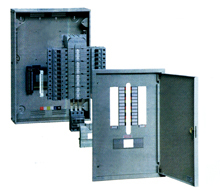 Hager’s circuit breakers are widely used in low voltage power distribution systems of industrial, commercial and residential buildings. Hager air circuit breakers (ACBs) have high dynamic and thermal stability. They ensure uninterrupted power supply but also break reliably at high short circuit currents. Hager’s TPN distribution boards include removable doors that are reversible for ease of fittings. Earth terminal bars are mounted offset to neutral terminal bars and angled towards the installer for easy cable connection. The screws are fully turned down for simple and fast cabling. There is an optional transparent IP2X neutral cover. Ease of phase identification L1, L2 and L3 mouldings show through when the front cover is fitted. Textured surface on the busbar assembly allows writing of circuit identification. Mitsubishi Electric has an impressive record of achievements in designing and manufacturing high-quality switchgear for customers worldwide. The switchgear main circuit and cables are constructed so that they can be disconnected without gas processing. When the power cable DC withstand voltage test is performed, it allows DC voltage to be applied to the power cables and cable sealing end only (power-receiving part is standard and other parts are optional). 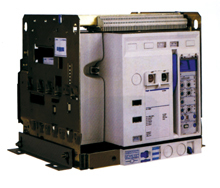 The optional condition-based maintenance (CBM) unit detects abnormalities in operating devices and other components. This helps prevent failures and realises efficient maintenance, leading to shorter inspection times and reduced lifecycle costs. Solid insulation can be added to the busbar connectors as an option to allow future system expansion between switchgear. This option not only reduces the gas processing work, but also contributes to reduced installation work when expanding the system. The high-tech electro-magnetic VCB operating mechanisms provide maintenance-free use for a period of over 15 years. The secret to this amazingly low maintenance requirement is placing the VCB and disconnecting/earthing switch in a hermetically sealed vessel and applying an original anti-oxidation grease to the moving parts of the disconnecting/earthing switch.